High on the adrenaline rush of trains already sighted, we were pacing that AMT West Island train and the temptation to indulge in a chase was too great. Between stations there would be no way we could keep up but the traffic was moving really nicely and, unlike the train, we didn’t need to stop at every station. I reasoned we could run as far as Beaconsfield and that distance might give us just enough time to park the car, grab the camera, and get out onto the platform in time for the train to arrive. With only minutes to spare we wheeled into the parking lot and with the car barely stopped we ran onto the platform in a manic style that really only those that have gone train chasing can truly know. We were in luck. The train hadn’t arrived yet and for those waiting on the platform, our mania provided a little evening rush hour entertainment. 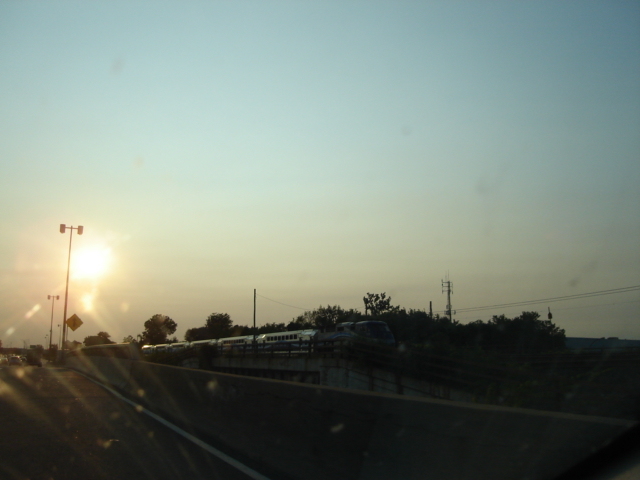 The evening’s sunset was just beautiful and I’m pretty proud of this set of photos. Walking back to the car I remarked that it would be evening cooler if we got to see one of the evening VIA trains. No sooner did I finish that comment did it appear. What a great pile of fun! Still on Autoroute 20 we continued our drive west across Montreal Island. It was around six o’clock and I hoped that we might see one of AMT’s West Island trains rushing commuters home. She’s shooting this through our bug-stained windshield and into the sun. You’d never know it. Heck, with this kind of talent on the camera I really don’t think I need to be a part of that at all. The future of railfanning in Canada? The kids are going to be okay and everything is going to be fine. 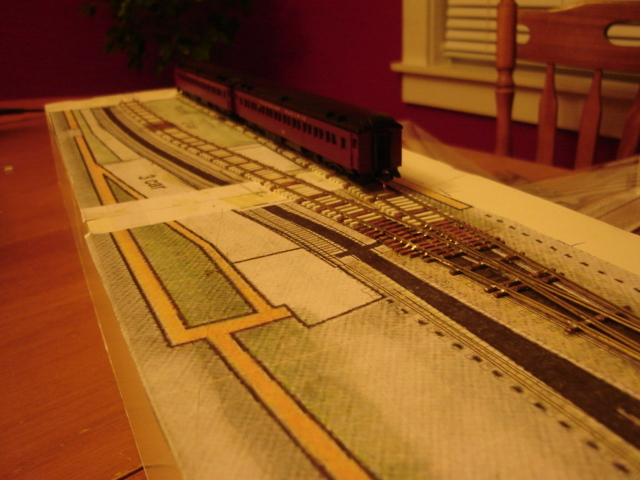 I’m just wrapping up a few more tasks on Prince Street tonight and thought I’d share an update on the layout. 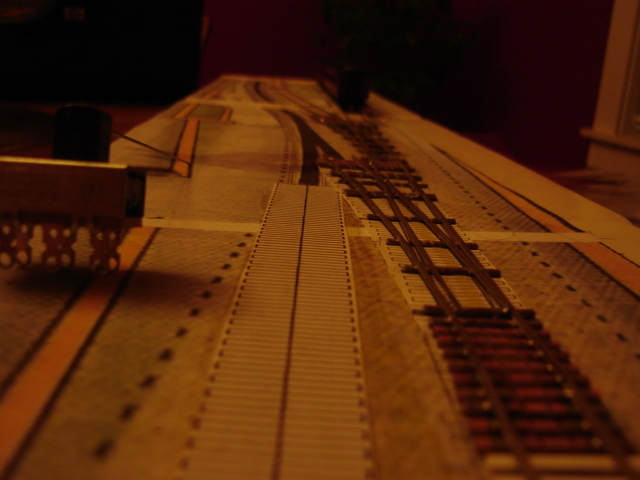 As mentioned, I have the first half of the track in place now and this means that if we had power in the rails we could bring a train from the fiddle yard and into the back platform. I have the second siding in place as well now so once that train has arrived, the station pilot can be used to move the coaches from that train and place them in the departure siding, thereby releasing the engine so it can be serviced and made ready for it’s next run out. I dug out an old 1/4″ DPDT slide switch and modified it to function as means of actuating, holding and routing power through a turnout. I also drilled out the throwbars on the two installed turnouts so they could be connected to this switch. I did try fitting this switch to see how well it would work to throw these turnouts and everything looks like it’s going to work out great. The slide switch’s throw is greater than I need for my N scale turnouts and I’m relying on the actuating rod (music wire) to compensate without placing too much stress on the turnout’s throwbar – I find that placing about 1-1/2″ of distance from the turnout to the switch seems to be the happy balance. The wire I’m using is 0.020″ diameter. I’m not sure what I’ll elect to use to actually throw the switch back and forth but I think a piece of brass rod should be fine to move the slide switch. Of course there are much more attractive options than the ubiquitous knob-on-the-fascia route. I think that Trevor Marshall’s use of large scale stands is very cool. Given that I grew up on a steady diet of British model railway magazines I think a small lever frame like this one from Brassmasters would be extremely cool and it might be something I try out here. With only three turnouts to move I feel this might be a great opportunity to try something different. One thing is for sure, no Caboose Industries ground throws. 1988 and yes, that’s an RS18 leading that commuter train! This photo appeared on the Canadian Railway Observations Facebook page this evening and I was really excited to see it. I have seen RS18’s on the point of Montreal commuter trains before, well photos anyway, but this might be the most “modern” one I’ve ever seen. I have had the pleasure of standing on that platform though. The 800’s, introduced in 1953, replaced open platform wooden coaches*, some of which I’d seen in Lambton later, awaiting conversion to service cars. When I began to use the line In 1965, the 800’s were then 12 years old, slightly older than some of the RDC’s used on occasional trains (where you could indulge in baggage compartment riding). Still used too at that time were 40 to 50 year-old ex-mainline coaches. These survived until the early 1970’s and would sometimes be mixed in with 800’s. The new gallery cars retired them in 1970, around which time the RDC trains seemed to become longer. I frequently came home to Pointe Claire on a nine or ten-car RDC train. There were also a couple of experiments. For a while in 1969 we had a full-length smoker, 1700, at the end of train 270 each morning. It had been built for Calgary to Edmonton service between 4-4-4’s. There was a short period when a bar car was attached to the end of one of the afternoon trains, but it didn’t last long. Motive power was always a steady diet of FP7A’s as now, with help from RS18’s and E8’s such as 1802. I would have hoped that with today’s new cars would come locomotives with about a thousand more horsepower to allow a faster schedule. Those paragraphs are ones that railfanning legend Robert Sandusky shared in 1989. 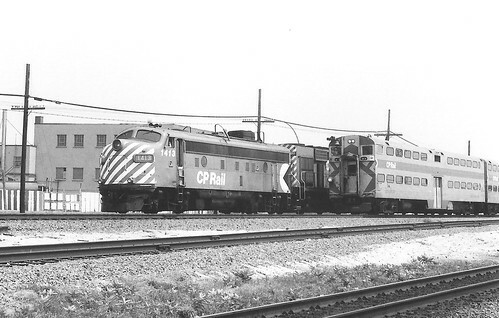 I enjoy reading his work and these kinds of first hand experiences really help illustrate the types of trains and operations one would have seen if railfanning CP’s Lakeshore trains in and out of Montreal during this time. Those RDC’s eh? I never doubted the many credible resources that spoke of how CP used RDC’s in commuter service but I’m really starting to buy in to it now. I have seen pictures of these massive RDC consists but had always assumed they were exceptions and not rules. In terms of attempting to translate the prototype into a convincing model I had assumed I’d need some RDC’s but wouldn’t typically need to consider their operation in much beyond perhaps a three car train. Looks like I was wrong. 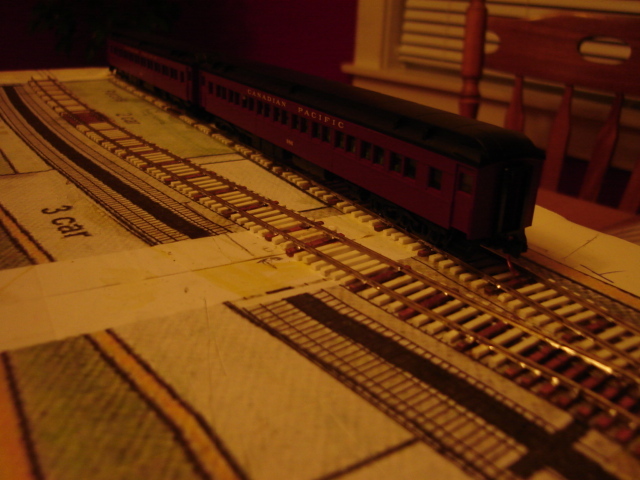 I have a couple of the old Con-Cor RDC1’s with the Roco drives in N scale. I consider these some of the finest operating models I’ve seen in N. I’ve seen the Kato model but never bought one. Looks like I should scramble and pick up a few while I still can. Looks like the hood of an RS18 or RS10 trailing that FP7 on the back track. I wonder what train it was on? I’ve seen lots of shots of that arrangement on the lead of the Canadian but to be honest I’d really like to hear it was on the lead of the commuter train headed in the opposite direction. Thanks to some excellent detective work as noted in the Comments attached to this post, the mystey trailing MLW is an RS10. Great points Chris, thanks for sharing them. Good evening. It feels like with the house move and a busy summer that I’ve really been neglecting this space and I’m keen to back into my usual threads. Now that we’re easing our way into fall I’m excited to share something that I really want to learn more about: Montreal commuter operations during in the era just before MUCTC. My focal point here is the CP Lakeshore operations from Windsor Station (Lucien l’Allier) and westward. There have been some exciting examples of rolling stock operated on this line and I’ve been buying up prints and slides as they become available. I’ve been bookmarking websites and similar content online for future reference. During the CP years it’s remarkable that while the coach fleet remained relatively homogeneous the motive power was anything but. The classic units on these trains would appear to be CP’s FP7’s. That said I have a nice slide of a maroon and grey RS18 leading a train of gallery cars and I’ve seen shots of sw1200’s, an FPA4 and RS10’s. While later than I’m concerning myself with I’ve also heard of chop-nosed GP-9’s borrowed from CP and LRC engines in AMT service. The RDC’s. 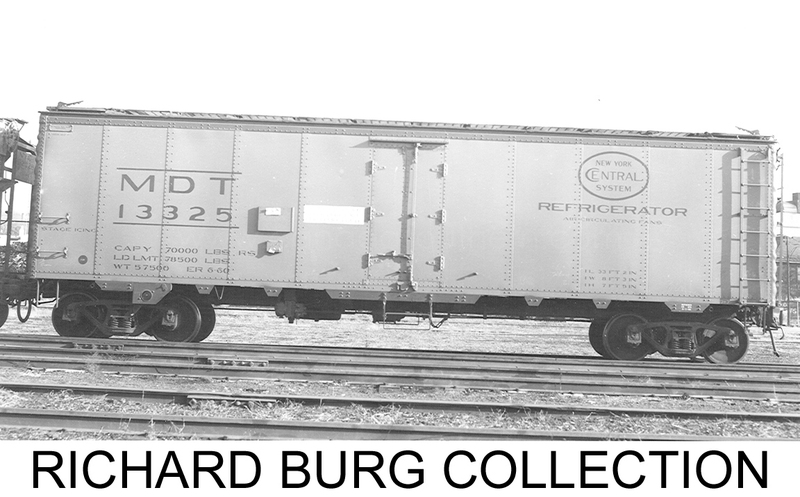 I’m really fascinated with the RDC’s that seem to have been the predominant feature of these services during the late 1950’s and throughout the 1960’s. I guess most commuter trains were RDC operations. The 800-series lightweight cars would have been around too. I wonder what hauled those trains? FP7’s? I don’t know. Maybe you’re readying this and you do. I’d love to learn more and to hear from you. How did they turn locomotive-hauled trains before push-pull operations started? Trains of 800-series coaches would have been locomotive-hauled but were not run in push-pull operation. With that in mind I’d like to know what happened with them when they needed to reverse at the end of their run. On arrival at Windsor did a switcher pull the coaches and move them onto a new line where a replacement engine would lead the train outbound? Did the entire consist back out of the station carefully to a wye and the entire lot get turned? I remember reading about the Grand Trunk operations into their Bush Street, Detroit station in the seventies. In that example one train pulled into the station. Once it was empty a spare engine coupled to the back of the train and that new engine would be the power for the next train out. Once that train had left the engine that it had arrived with (the old one) became the spare that would cycle onto the next inbound train. Neat system. Did CP try the same gig at Windsor? I imagine that most of CP’s trains were FP7-led so this wouldn’t work. What do you think? Next steps. I have some timetables and am starting to put together some consist data. I’m thinking about creating some timelines to document what types of motive power were recorded on what trains. As a modeller’s aid this might be really handy when trying to justify the purchase of a neat model. I’m excited about this and getting back into some commuter rail research.